With its colleges, museums and river-borne punts, Oxford offers plenty to see for the visitor  far more than can be crammed into a day trip from London. Those who want to maximize the experience can now do so in a wallet-friendly way, by booking a college room for the night. Lord Sebastian Flyte might well have sniffed at the thought of tourists tramping across quadrangles and up worn oak staircases  and his creator Evelyn Waugh undoubtedly so  but with accommodation from just $58 a night, it's an attractive prospect for travelers looking for their own little slice of Brideshead Revisited. It certainly beats paying over the odds for a city-center hotel room or ending up in some suburban B&B. The Oxford college room of yore  despite the romantic connotations  was very likely to be a cold, damp and creaky affair, with moth-eaten armchairs and rudimentary amenities (picture narrow single beds and a sink and mirror in the corner). These days, though, many have been revamped to include ensuite bathrooms, complimentary toiletries, power showers and Internet access. All are spotlessly clean. Seven of Oxford's 38 colleges, including Queen's, founded in 1341, and Keble, a neo-Gothic pile built in the late 1800s, offer accommodation to the traveling public. 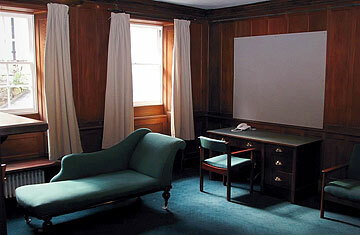 Available rooms are mostly singles or twin share, although Keble offers a few family suites sleeping three. A full English breakfast (or a less gut-busting muesli-and-yoghurt option) is thrown in, and you could very well be enjoying it on trestle tables in a centuries-old, wood-paneled dining hall, under the stern gaze of portraits of college worthies. Afterward, you're free to stroll around your adopted college's grounds. If your overnight stay has given you a taste for Oxford behind the scenes, you could also try taking the entertaining 90-minute guided tour from Oxford Walking Tours, www.oxfordwalkingtours.com, which gives access to off-limits areas and costs around $10. Needless to say, rooms are in very tight supply during university terms, so time your visit with the major holidays, which last roughly from mid-June to mid-October, mid-December to mid-January and mid-March to mid-April. Accommodation can also be booked at Cambridge, Durham and Canterbury universities, among others. See www.universityrooms.co.uk for more.